The past and future of transportation history mingle in this great photo of Golden Gate avenue in 1911, from the SFMTA photo archive. I don't just mean the mix of horse-drawn and motorized vehicles in the street: what's most interesting about this photo is the presence of a livery stable, a full-service garage, and a taxicab company, all in the same shot. 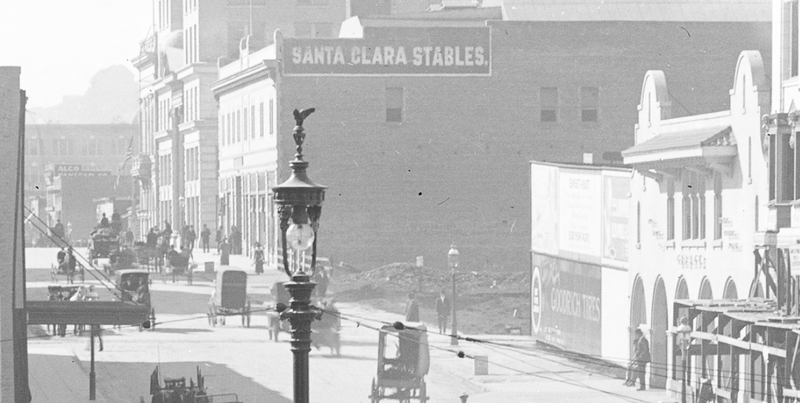 At the center, the Santa Clara Stables, one of the great old livery stables of the city. In the 1800s, if you needed to rent a horse or a carriage, or a place to keep a horse and carriage, this was where you came. Like many livery stables, the Santa Clara also ran a small fleet of hacks. Rebuilt after the fire, in 1911 the Santa Clara only had one more year of existence left before it would be shut down and its inventory sold at auction. In the foreground can be seen the Mission-style facade of the Golden Gate Garage. 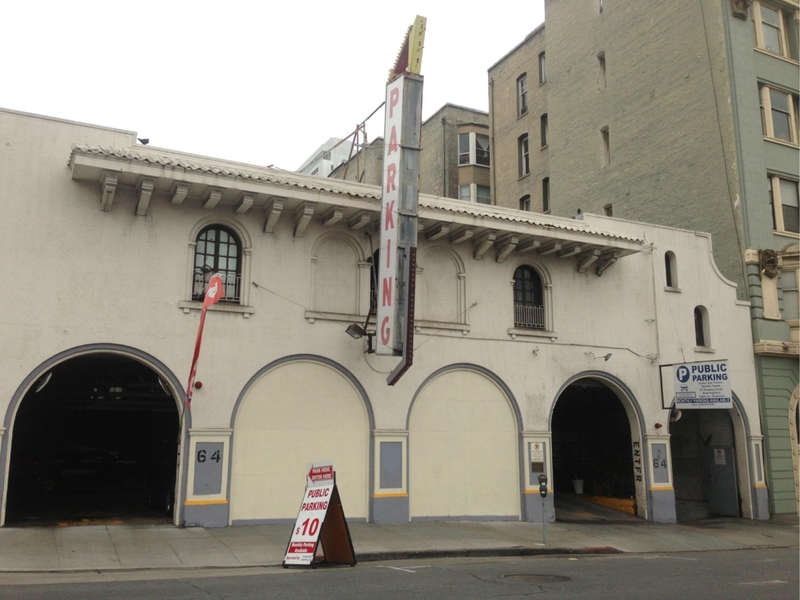 This beautiful old garage has been described as "surprisingly lyrical" by Mark Kessler, author of an amazing book on The Early Public Garages of San Francisco. Kessler notes that, by adopting an architectural style associated with Southern Pacific railroad stations, the Golden Gate “relies upon a continuity of imagery to assert that the garage is the successor to the train station, and the car is successor to the train.” More obviously, it was the successor to the livery stable up the street. Boasting a lounge for chauffeurs (waiting around the garage while their employers shopped, dined, etc. 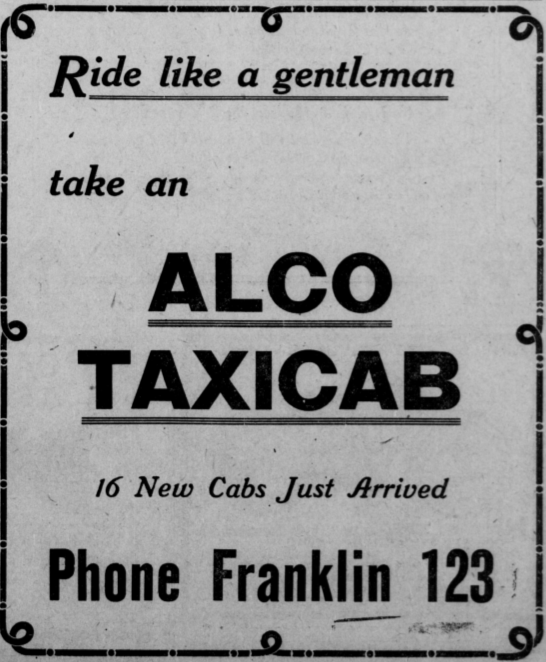 ), the Golden Gate was also involved in the auto livery business, and at one point housed a taxi service. Now a mere parking garage, the building still stands at 64 Golden Gate, somewhat neglected and under-appreciated, like most old garages. 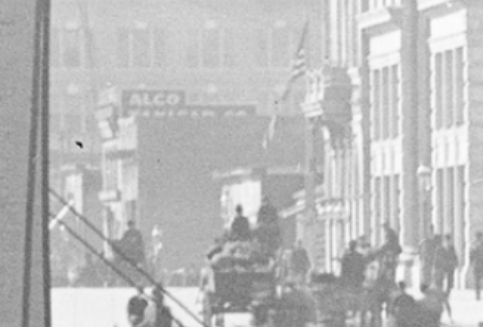 And in the distance, the sign for the Alco Taxicab Company peeks over a building. 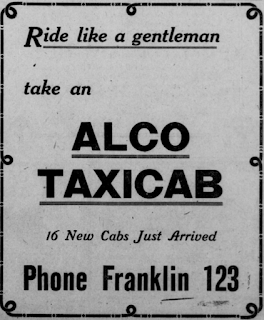 This is the kind of cab company that would last out the Twentieth Century, long after livery stables and full-service garages had been forgotten. In this year of 1911, one of Alco's drivers was a young Malcolm Loughead, who would later found the Lockheed corporation with his brother Allen.